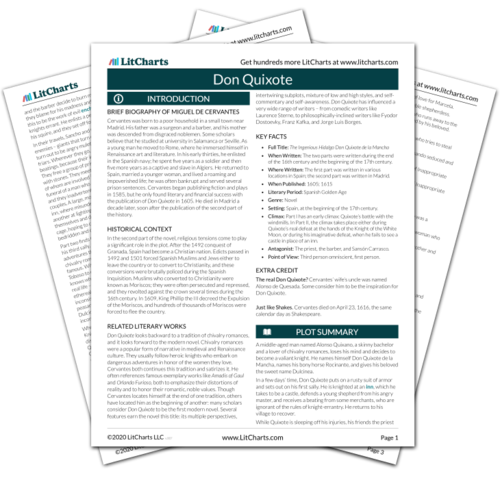 Instant downloads of all 942 LitChart PDFs (including Don Quixote). 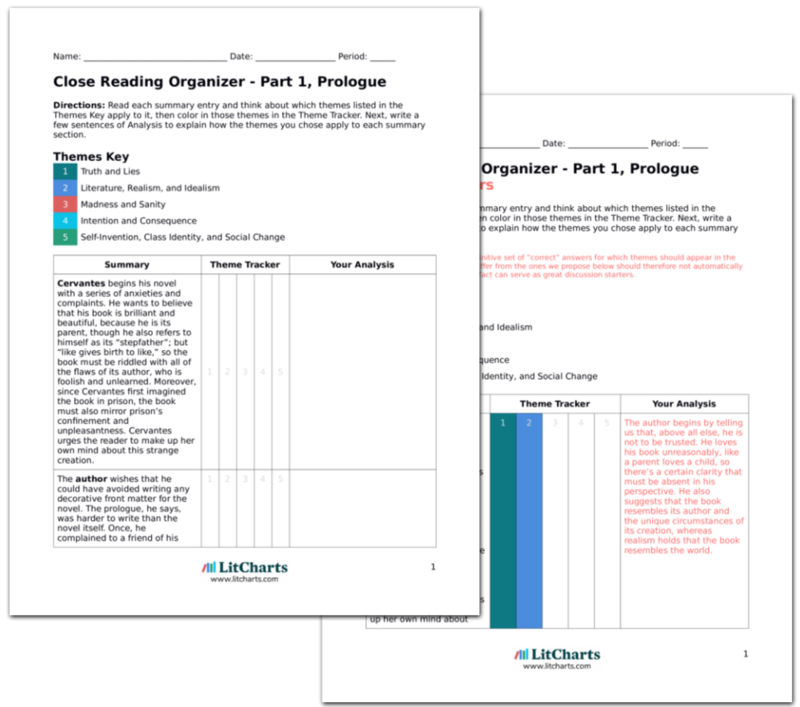 LitCharts assigns a color and icon to each theme in Don Quixote, which you can use to track the themes throughout the work. Sancho explains that his donkey was stolen the night after the adventure with the dead body, and a few days after that he saw the donkey carrying Ginés de Pasamonte and took it back. Carrasco explains, though, that the author mentions Sancho riding the donkey before he retrieves it from Ginés. Sancho also explains that he gave the gold coins to his wife. Carrasco tells them that some people have been asking about a second history, clamoring for more “quixotry” where Quixote fights and Sancho talks. Sancho is sure that soon enough he and his master will provide the author with plenty of material for a second book. Quixote hears Rocinante neigh, which seems like a good sign, so he decides to strike out on his third sally within the next few days. After Cervantes published the first volume of the history, critics pointed out certain gaps and inconsistencies, the main one being the mysterious reappearance of the donkey that never disappeared. Cervantes takes the opportunity to clarify some of the inconsistencies, using Sancho as a mouthpiece. Here, we see the birth of the word “quixotic.” We also observe the beginning of a literary self-consciousness in Sancho and Quixote; they now conceive of their adventures as both actions and plot points. Sancho is concerned that his master attacks too freely and irresponsibly, and warns Quixote and Carrasco that he will take care of his master but he won’t fight for him anymore. “Being brave is halfway between the extremes of being a coward and being foolhardy,” and Sancho implies that his master is too far to the right of the spectrum. Carrasco tells him not to worry, because he will be rewarded with a whole kingdom for his trouble; Sancho counters sensibly that “too much would be just as bad as too little,” though he would be a great governor if given the chance. Quixote agrees and asks Carrasco to keep his imminent departure hidden. We have said that Quixote represents the head and Sancho the body. But we learn (in the previous summary block) that Quixote is beloved for his actions and Sancho for his words – an apparent inversion (the body being responsible for action and the head for speech). Perhaps readers love the two characters not for the qualities they already possess but for the qualities they are developing. Tsykynovska, Helen. "Don Quixote Part 2, Chapter 4." LitCharts. LitCharts LLC, 3 Mar 2014. Web. 19 Apr 2019. Tsykynovska, Helen. "Don Quixote Part 2, Chapter 4." LitCharts LLC, March 3, 2014. Retrieved April 19, 2019. https://www.litcharts.com/lit/don-quixote/part-2-chapter-4.